One of my Uni of Melbourne work friends likes to go hiking to wonderful places with some long-time friends from her own uni student days along with other invited tag-alongs. I’ve been on one of Ann’s trips in the past, to the lighthouse at Wilson’s Promontory, but circumstances had conspired to prevent me being able to go on a couple of other trips further afield. 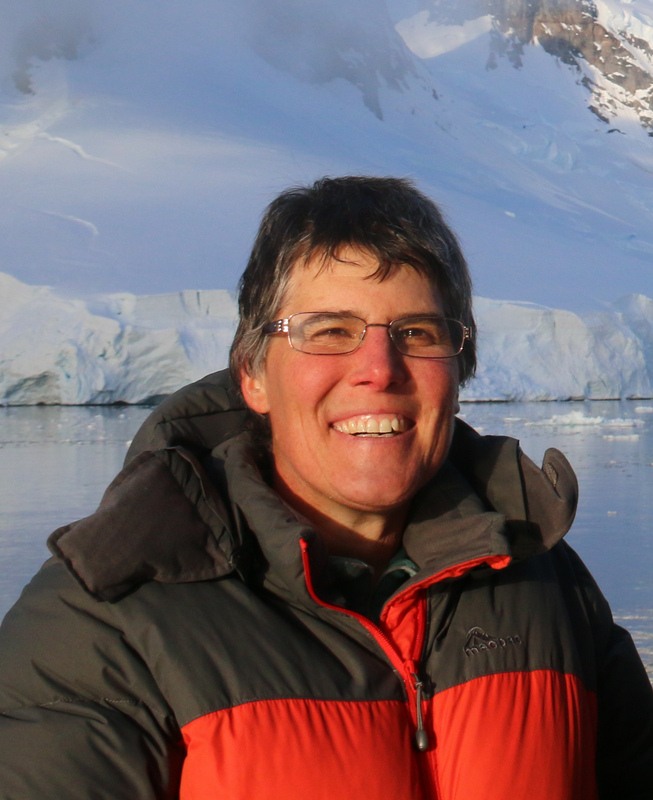 When Ann told me that she was planning a hike in NZ in the 2012 new year, I drooled but hesitated because it was scheduled for just after I moved to Tasmania and I knew I would still be unpacking and settling in … but then I just decided to go anyway. We all met up in Napier a day or two before the start of the walk, a party of ten — shown at right just before we set off on the actual hike — ranging in age from the youngest (me) to a 70 year old, with many of the party being fit and enthusiastic folk in their 60s (setting examples to aspire to for the future). 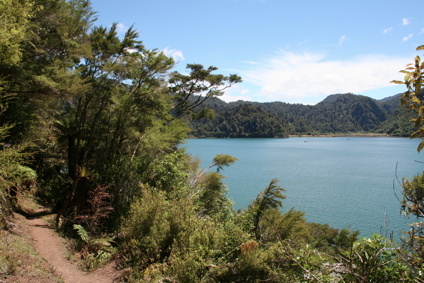 We travelled by bus from Napier to Wairoa and then car shuttles to Lake Waikaremoana, in order to embark on one of New Zealand’s famous “Great Walks”. These walks pass through spectacular scenery, the tracks are very clearly marked and often (though not always) more carefully graded and constructed than some of the rougher back-country hikes, and not only are there huts available but they have running water, mattresses for the bunks, and sometimes even stoves for cooking (though not in this case). Since the walks are very popular (NZ’s famous Milford Track is one such walk) you have to book the huts in advance, which also allows control of visitor numbers to regulate the impact on the environment. We set off the next day, my pack containing a food bag that felt ridiculously heavy (but then it had 5 days’ worth of food) but without the added weight of a tent (which was just as well! 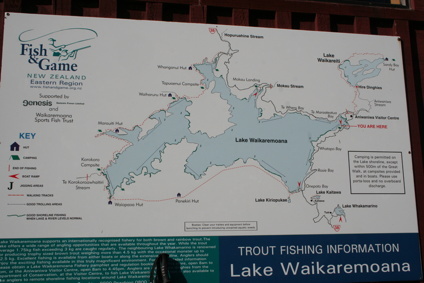 ), with the trek beginning with a trip across the lake by water taxi (speed boat) to get to the start of the track. We were doing an anti-clockwise circuit of the lake, which meant that we would spend three days or so working our way around the lake’s edge before tackling the climb and descent of the Panekiri Range which overlooks the lake at its southern end. After farewelling the water taxi at the drop-off point we shouldered packs* and headed along the track. This skirted the shores of the lake, although the temperate rainforest, in all its beautiful lush dense greenness, goes right down to the water’s edge for much of the trip, meaning that you spend most of the time under its shady canopy and it’s only every so often that you get a good view out over the lake. Our first day’s walk was about 8 or 9km and we arrived at the Waiharuru Hut not long after a late lunch, allowing us plenty of time to relax, cook cheesecake (my contribution to the evening meal) and enjoy the views of the lake and far range in the afternoon. I’ve documented the day’s travel with a few photographs and extra words on a separate page, which can be found by clicking here. * Me, being me, decided to carry all my gear**. 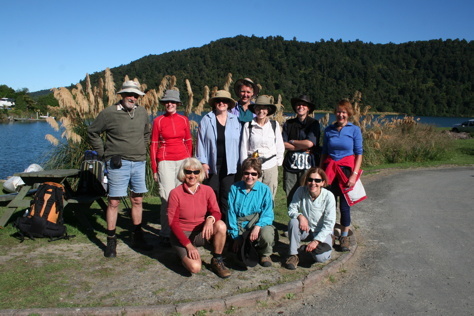 The others took advantage of the water taxi service which allowed them to have all but the necessities needed on the walk transported to the next overnight stop, which could be done for all the hut stops except for the last on top of the Panekiri Range. ** I claim that this is because it has been a while since I have done an extended walk (more than two nights), and I wanted to see if I was up to carrying a full pack on a longer trip (not that it was an entirely accurate test, because I wasn’t carrying the tent or a sleepmat). I’d like to think — egotistically perhaps — that the others thought I was being considerate of their age, and using the extra load as a handicapping method to slow down my real (or imagined) youthful enthusiasm. However, I suspect the others were actually thinking that I did it because I am a stubborn idiot. They’re probably right. I’ll vote for youthful enthusiasm! Look out for rocks in your pack next time!